Your browser does not support iframes. We can recommend the Firefox browser. 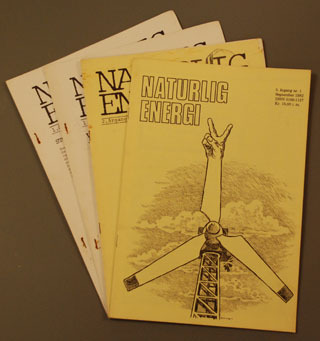 Just 4 month after the birth of the turbine owners organization "Danske Vindkaftværker", the members received the monthly publication "Naturlig Energi". Torgny Møller published the first issue of Naturlig Energi in September 1978. 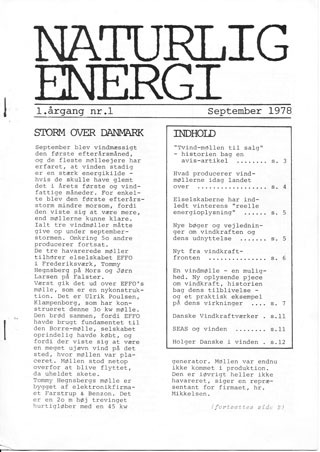 The monthly magazine was connecting members of the new organisation for Turbine Owners: "Danske Vindkraftværker". The first issue told about a storm in month of September, that took its toll when more than 5 turbines crashed, at a time when less than 100 wind turbines were operating in the Danish landscape. Astory about the TVIND turbine and also a story of the hardships of Christian Riisager as a turbine manufacturer. The address of the editorial was, and still is, in the same buildings that house the Møller family, on a windy slope with a beautiful sea view over the Kalø Vig landscape in eastern Jutland. The first ever Riisager 22 kW turbine was online at Torgny Møller on November 1st. in 1976. In 1982 the turbine was replaced by a 30 kW Nordtank turbine. In 1988 a 400 kW Micon took its place, and since 1996, a 600 kW Nordtank (NEG) turbine has produced 1.6 million kWh per year to the Møllers and the editorial. One of the most important functions of Naturlig Energi, was the publication of the monthly electricity production statistics for nearly all Danish private owned and public owned wind turbines. This helped new buyers of turbines to decide wether the Turbine manufacturers brochures were telling the truth. Especially the lines below the staistics, with the owners reports of reason for downtime of the turbines were studied with interest. The magazine also brought essential information about insurance companies, new legal rules and plans. Of course the 179 members of the Danish Parliament, the "Folketing" each received their monthly copy of Naturlig Energi. In 1982 Torgny Møller began publishing, what later became the worlds most important and comprehensive international wind turbine magazine: "Windpower Monthly". Later Torgny started the publication of "Vindstats", that collected comprehensive monthly statistics of the electricity production of all turbines in Denmark. In 2008 Torgny Møller sold the Windpower Monthly to a British publishing house : Haymarket Business Media of London. Learn more on the Naturlig Energi and Windpower Monthly websites, found on the LINKS page.